GameStop loves its retailer-exclusive downloadable content, but Skylanders Giants DLC all comes by way of toys. What's the world's largest dedicated video game retailer to do? Exclusive toys, of course! GameStop is now taking preorders for the Golden Dragonfire Cannon Battle Pack. 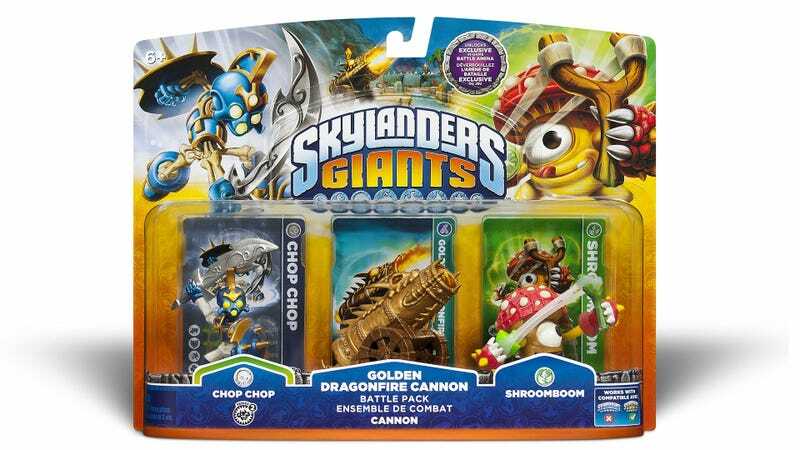 a special package that contains the series 2 version of the Skylander Chop Chop, a new figure named Shroomboom and the Golden Dragonfire Cannon, which when placed on the Portal of Power while playing Skylanders Giants unlocks a special in-game battle arena. Activision and Toys for Bob have previously released limited edition recolorations of existing toys for Skylanders: Spyro's Adventure, but never before has a retailer had a lock on a figure that provides exclusive in-game benefits (except for Toys R Us' Legendary figures, which had slightly better stats) . Pretty sure this will be more of a timed exclusive situation, but collectors might want to head to GameStop and put a little money down, just in case. Skylanders Giants hits stores on October 21.